We’d love your help. Let us know what’s wrong with this preview of Broken Brain, Fortified Faith by Virginia Pillars. The terms "mental illness" and "mental health" are often used casually, but many don't believe mental illness is relevant to their lives. However, studies show that more people live with mental illness than heart disease, lung disease, and cancer combined. Broken Brain, Fortified Faith is the story of one family's journey through schizophrenia, navigating the uncharted wate The terms "mental illness" and "mental health" are often used casually, but many don't believe mental illness is relevant to their lives. However, studies show that more people live with mental illness than heart disease, lung disease, and cancer combined. To ask other readers questions about Broken Brain, Fortified Faith, please sign up. This was an excellent read, well-written and compelling. Thankfully, we are moving away from the stigma of talking about mental illness. Back in the sixties, my father (now deceased) suffered from schizophrenia as well as manic depression. But it wasn’t something he could share with either employers or anyone outside of the family. In this book, the author takes us step by step through her journey of, at first, disbelief, then frustration to — finally — hope and recovery. Highly recommend! Broken Brain, Fortified Faith is the true story of how one woman deals with her adult daughter’s diagnosis of schizophrenia, several hospitalizations, legal issues, and other family crises, over a two-year period, including: infertility, the death of an infant grandson, and her daughter-in-law’s breast cancer. This memoir describes how the family struggles with these difficult issues and responds to the setbacks with the help of trusted friends and support groups. Once I began reading Broken Brai Broken Brain, Fortified Faith is the true story of how one woman deals with her adult daughter’s diagnosis of schizophrenia, several hospitalizations, legal issues, and other family crises, over a two-year period, including: infertility, the death of an infant grandson, and her daughter-in-law’s breast cancer. This memoir describes how the family struggles with these difficult issues and responds to the setbacks with the help of trusted friends and support groups. Once I began reading Broken Brain, Fortified Faith, I found it difficult to put down. It is a compelling read, understandable, and well-written. The author writes in a captivating, candid style, sharing all her emotions – her anger, frustrations, and heartaches, as well as her blessings, hopes, and joys. The central theme of this book — the miraculous power of love and prayer to bring healing and hope in the midst of pain and suffering – captured my heart. Reading this book was like having an intimate conversation with a good friend, the kind of friend who is honest, loyal, and supportive. The author is certainly someone I would want for a friend in a time of difficulty – a woman of fortitude, prayer, and patience who finds her strength in the Rock, the Fortress, and the Deliverer. By sharing her beautiful memoir, she is blessing many who feel alone in these challenging trials. Virginia Pillars' memoir of a mother navigating the world of parenting a young adult with a brand-new diagnosis schizophrenia is at once heart-wrenching, informative and inspiring. Pillars honestly describes her day-by-day experience with her daughter's illness and recovery, with a view toward helping other families whose lives are touched by a frustrating disease. I didn't think I'd have the strength to finish this--it is very real and descriptive, heartbreaking. Like The Shack, I had to put it aside after the first few pages. But I made myself sit back down. Then I couldn't stop. I read it entirely in (almost) one sitting. What an amazing and inspirational story! While my relative had a different mental illness causing her psychosis, the pain it caused me and my family was identical to the Pillars'. It is so good to know that God never abandons us. Mrs. I didn't think I'd have the strength to finish this--it is very real and descriptive, heartbreaking. Like The Shack, I had to put it aside after the first few pages. But I made myself sit back down. Then I couldn't stop. I read it entirely in (almost) one sitting. What an amazing and inspirational story! While my relative had a different mental illness causing her psychosis, the pain it caused me and my family was identical to the Pillars'. It is so good to know that God never abandons us. Mrs. Pillar's verbiage is clear and direct. Her story leaves out nothing, exposing the raw and sometimes embarrassing aspects of living with someone whose brain is, well, "broken." Some of the things that happened in this story even remind me of situations dementia patients' families experience. I cannot imagine the strength it must have taken Mrs. Pillars to write this book, and I encourage everyone to read it. 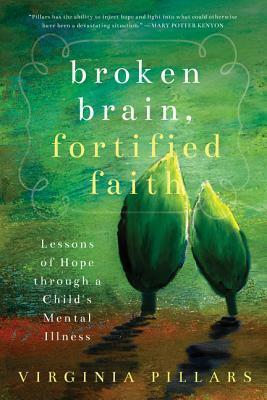 I received a review copy of "Broken Brain, Fortified Faith" by Virginia Pillars. What an amazing book of hope and determination! When her college-educated daughter Amber began exhibiting unusual actions and symptoms, Pillars and her family were taken on a journey filled with pain and the eventual diagnosis of schizophrenia. Virginia Pillars doesn't hold back. She delivers a nitty-gritty story filled with her honest emotions, deep faith, and a strong love of family. This book will touch readers l I received a review copy of "Broken Brain, Fortified Faith" by Virginia Pillars. What an amazing book of hope and determination! When her college-educated daughter Amber began exhibiting unusual actions and symptoms, Pillars and her family were taken on a journey filled with pain and the eventual diagnosis of schizophrenia. Virginia Pillars doesn't hold back. She delivers a nitty-gritty story filled with her honest emotions, deep faith, and a strong love of family. This book will touch readers long after they've read the last page. I don't remember when or how this book came to my attention, but it's been on my to-read list for a while, one because the author is a fellow Iowan, and two because she writes about a subject on which the general public is not well-informed. Mental illness is also a matter of concern in our state given the state's cuts in funding and services in recent years. Pillars does not touch on those issues. Rather she relates her family's experience with her daughter's mental illness. Writing from her he I don't remember when or how this book came to my attention, but it's been on my to-read list for a while, one because the author is a fellow Iowan, and two because she writes about a subject on which the general public is not well-informed. Mental illness is also a matter of concern in our state given the state's cuts in funding and services in recent years. Pillars does not touch on those issues. Rather she relates her family's experience with her daughter's mental illness. Writing from her heart she tells of the pain and confusion of acknowledging her daughter's illness and the role her faith played in navigating the unfamiliar terrain of psychiatric wards and finding the right combination of medicines to enable her daughter to manage the symptoms of schizophrenia and live independently. Pillars' memoir is helpful and hopeful for other families and caregivers dealing with the mental illness of a loved one. In fact, her advice is applicable to any difficult life situation: learn all you can about the issue, seek out family and friends for support, and permit your faith, however fragile, to sustain you in the dark times. Mental illness is so overlooked in many ways. Sometimes symptoms have to get to a breaking point for families agree to seek care. In many situations brain dysfunction sneaks in the back door. Broken Brain, Fortified Faith is a story of a mother's love and devotion. It is also a story of a daughter's struggle and beauty. The obstacles and difficulties Pillars writes in her memoir are portrayed with raw emotion. I admire Amber's courage and Virginia's bravery for telling her story. A must read! I won this book and it’s not a book I would have selected. That being said, I couldn’t put it down. Knowing this was a real life event, I needed to know if the family stayed intact. What truly surprised me were the other life events the family endured. And the author strong faith was doubted. I definitely recommend Broken Brain, Fortified Faith. Any families that have a loved one that struggles with mental illness this book is for you. This story outlines that struggles of schizophrenia and its impact on a family. I found this book not only informative but inspiring. Though the road to recovery may be long it’s attainable and this book highlighted just that. I found this book to be an excellent resource for families who care for mental illness sufferers. Pillars has written about her daughter who began exhibiting symptoms of schizophrenia in her late teens and early twenties. Through the Virginia's well told story, we learn that good outcomes rely on family, friends and mental health professionals working together and supporting each other. Virginia's own research is also great and recommends some very good further reading resources and support group I found this book to be an excellent resource for families who care for mental illness sufferers. Pillars has written about her daughter who began exhibiting symptoms of schizophrenia in her late teens and early twenties. Through the Virginia's well told story, we learn that good outcomes rely on family, friends and mental health professionals working together and supporting each other. Virginia's own research is also great and recommends some very good further reading resources and support groups and websites. This is a riveting story written with honesty and strength. Terrific book! Virginia Pillars lives on a farm, along with her husband of forty-three years. She is the mother of four, one of whom suffered from a mental illness, and a grandmother of four with a passion for reaching out to families who are also affected. She details her journey through mental illness with her child in her memoir, Broken Brain, Fortified Faith: Lessons of Hope Through a Child’s Mental Illness, winner of the 2017 Selah Award and the CWG Seal of Approval. She contributed to Grief Diaries Poetry, Prose & More. Virginia speaks on the effects of mental illness on families and her faith journey, plus she volunteers for the NAMI (National Alliance on Mental Illness) organization as an educator/support group leader.